Nina Teicholz on WSJ, "Carbs, Good for You? Fat Chance! " Since the 1980 call for Americans to increase their consumption of carbohydrates and avoid fats, the general health of the entire population has declined to an all-time low. Why, if this is the case, is the government continuing to promote carbs and, as a result, misleading the public and putting peoples’ health at risk? Nina Teicholz reports. Nina E. Teicholz, MPhil; Fabiano M. Serfaty, MD, "The Latest Attack on Low-Carb Diets: Science or Politics?" The low-carb diet has been proven to reverse diabetes, promote weight loss, and improve most heart disease risk factors. But, one recent paper published in the the Lancet has stated the opposite, arguing that a low-carb diet shortens lives. Which assertion is the right one? Opinion Piece in the New York Times, "The Government’s Bad Diet Advice"
Weekend Opinion piece in The Wall Street Journal, "The Questionable Link Between Saturated Fat and Heart Disease"
'Saturated fat does not cause heart disease'—or so concluded a big study published in March in the journal Annals of Internal Medicine. How could this be? The very cornerstone of dietary advice for generations has been that the saturated fats in butter, cheese and red meat should be avoided because they clog our arteries. For many diet-conscious Americans, it is simply second nature to opt for chicken over sirloin, canola oil over butter. Nina Teicholz: Op-ed in The Wall Street Journal, "The Last Anti-Fat Crusaders"
Op-ed on CNN.com, "Our Fear of Fat is Melting"
Eating fat helps heart health and weight loss, concluded a widely reported clinical trial this week. The result did not surprise close followers of nutrition science since it echoed a decade's worth of similar studies. But, unlike its predecessors, the new trial was not ignored by nutrition experts and the media; that was the real news. It's a sign that a half-century-long fear of dietary fat might finally be melting away, exactly the breakthrough needed to start healing the nation's health. 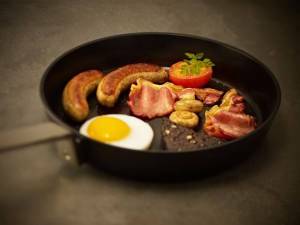 Nina Teicholz: The Independent, "The science of saturated fat: A big fat surprise about nutrition?" When Ronald M Krauss decided, in 2000, to review all the evidence purporting to show that saturated fats cause heart disease, he knew that he was putting his professional career at risk. Krauss is one of the top nutrition experts in the United States, director of atherosclerosis research at Children’s Hospital Oakland Research Institute and adjunct professor of nutritional studies at the University of San Francisco at Berkley. But challenging one of his field’s most sacrosanct beliefs – that the fats in meat, cheese and butter are bad for health – was a near-heretical act. The Washington Post, "Low-Fat Products"
The Atlantic, "How We Got Red Meat Wrong"
Early American diets weren't as plant-based as we think. Yahoo! Shine, "Myth: Low-Fat Diets Prevent Cancer"
Book Excerpt, Big Fat Surprise A widely held belief about women's health-that dietary fat causes cancer, including breast cancer, has turned out not to be supported by scientific evidence. From The Big Fat Surprise: Why Butter, Meat & Cheese Belong in a Healthy Diet. Tips on Healthy Living, "We Might Be Replacing Trans Fats With Something Much Worse"
Book Excerpt, Big Fat Surprise Today, vegetable oils such as soybean, corn, safflower, sunflower, or cottonseed oil–or “polyunsaturated fats”–are commonly used to replace trans fats. But when heated to temperatures required for frying food, these highly unstable oils can create oxidation products that are extremely toxic. From The Big Fat Surprise: Why Butter, Meat & Cheese Belong in a Healthy Diet. Family Circle, "Fat vs. Fiction: The Truth About Fat in Your Diet"